Hello and welcome from the Yale QuestBridge Scholars! The Yale QSN Chapter is full of vibrant, creative, and driven individuals who strive to represent QuestBridge on campus and build a sense of community among QuestBridge Scholars and other low-income or first generation students. We have been a Quest chapter for several years now, and grow bigger each year! We are formally recognized by the administration, who are eager to work with us to grow the program and make Yale a great place for QuestBridge Scholars. We work closely with the admissions office to welcome new scholars into our family and help acclimate them to Yale and college in general. Every year we have multiple events with the admissions office, including a pizza party where we celebrate the new matches and get involved in contacting them to answer any questions they might have about Yale. Our QSN Chapter holds weekly events, including weekly family dinners, movie nights, game nights, internship panels, theater events, class selection advising sessions, and outings to New Haven destinations. Our weekly dinners are a great way to catch a meal with students who understand what you are going through, who care about you, and who are devoted to making your experience at Yale the best it can be. Our popular game nights are a great way to de-stress and spend time with fellow Questies outside of an academic environment. We also host events during Bulldog Days, our Admitted Students week, including a special breakfast with the admissions officer who represents QuestBridge at Yale and a very popular fondue night. 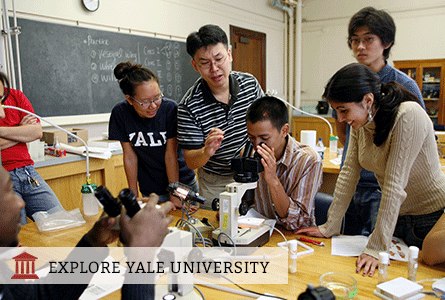 Thank you for considering Yale, and we hope to have you on campus soon!